In this lesson, you'll see three cases in which stress pronouns (moi, toi, lui, elle, soi, nous, vous, eux, elles) are used in French. I'm in front of them. Jean est plus grand que moi. Jean is taller than me. Il mange moins de viande que vous. He eats less meat than you do. Ma sœur chante aussi bien qu'elles. My sister sings as well as they do. - with the restriction ne... que (only), after que. Je ne veux que toi ! Soi is used to represent a universal "one[self]", in general statements or descriptions. It's the stress pronoun matching the general meaning of "on" (we/you/people) or the impersonal "il". On ne doit pas penser qu'à soi. One mustn't think only of oneself. Il faut toujours aider plus petit que soi. One must always help those smaller than oneself. Je pense à mes amis. Je pense à eux. I'm thinking about my friends. I'm thinking about them. How to know when to use "soi" or "soi-même" to say "oneself"? I agree that it's indeed quite a tricky point! ​I would say however that we will tend to use soi rather than soi-même after prepositions (devant, avec...) and with comparisons or after que in general. ​Il faut le faire soi-même. ​Merci et bonne journée ! I apologize, here is the question: An A2 question asks the french translation of "One must always look in front of oneself." I responded with "Il faut toujours regarder devant soi-même," and it was marked as incorrect. The correct answer was "Il faut toujours regarder devant soi." I am confused why one would not use "soi-même" for "oneself" in this instance. I think its because you need a stress pronoun after a preposition such as devant rather than stress+même. Aurélie and Laura have answered this very same question asked by a later poster. When to appropriately use soi and soi-même? This lesson didn't address this issue. "Pour l’apprendre aux autres il faut le savoir soi-même." -- To teach it to others one must knkow it oneself (or: you must know it yourself). Il vaut mieux le faire soi-même. --It’s better to do it yourself.Does that help? -- Chris (not a native speaker). Check the later questions. Aurélie and Laura answered this question there. I'm confused why "I speak of her" is "Je parle d'elle" as my first instinct would be to say "je l'en parle". What am I missing here? Thanks. Je parle à Marie de son travail. -- I speak with Marie about her work. Je lui en parle. -- I speak with her about it. Je te parle -- I speak with you. Je lui parle -- I speak with him (or her; only context would tell). "Je l'en parle" is definitely incorrect. Hi Chris, if I want to say: "I speak with him about them", is it : "Je lui parle d'eux" ? I find it difficult to know when soi versus soi-même is used. Sometimes when the english meaning is oneself, I reach for soi-même but the correct choice is sometimes soi. Any hints please? On doit le faire. -- One has to do it. On doit le faire soi-même. -- One has to do it oneself. In this case you always add "-même". "On doit le faire soi" is simply wrong because "soi" by itself is a reflexive pronoun (like "me", "se", etc.). To make it a stress pronoun, add the "-même". Here is an example, where "soi" is used in a pure reflexive sense and not as a stress pronoun (hence sans "-même"): On doit prendre soin de soi. (One has to take care of oneself). Stress pronouns lui and elle. I am still confused about the stress pronouns lui and elle. Is there a reason why lui is used as a stress pronoun with manquer (à), but elle is not? Bonjour Susan, Of all the questions about advanced stress pronouns, this is possibly the most interesting because of the verb «manquer à» Let's look at this example. Jean lui manque. --> She/he misses Jean If you recall, the noun and pronoun orders are reversed with the verb, hence the pronoun is actually the person who feels he/she is missing someone even though literally it would be stated Jean is missing to him. i.e. he misses Jean. Now recalling that «to him» in French becomes à lui. Therefore the phrase becomes Jean lui manque. And from the lesson: Notice that stress pronouns are used in the following 3 cases: - in sentences, after prepositions (de, à, avec, derrière, pour etc), - in comparisons, after que (plus/moins/aussi ....que), - with the restriction ne... que (only), after que. I hope that this is useful and that I have answered and help clarify this for you. Bonne chance. Thank you. That was exactly my understanding. However, in the A2 test that I took, the question said to translate, "She misses Jacques". I wrote "Jacques elle manque." That answer was marked incorrect, and the correct answer was given as, "Jacques lui manque." When I went back to the lesson on manquer (à), I saw that "elle" was not included in the list of stress pronouns to use before manquer. I thought there must be some special exception. Bonjour encore, So here are the pronouns, notice I did not say stress pronouns, the one uses with manquer à, Note that to introduce the person who it lacks to, you either use manquer à + name, or to use pronouns (i.e. I, you, he, we, they... miss), you will use the me/te/lui/nous/vous/leur before manquer. I hope this helps clarify this. Obviously, elle is used as a stress pronoun, not as a regular pronoun, for that it become «lui». Bonne chance. 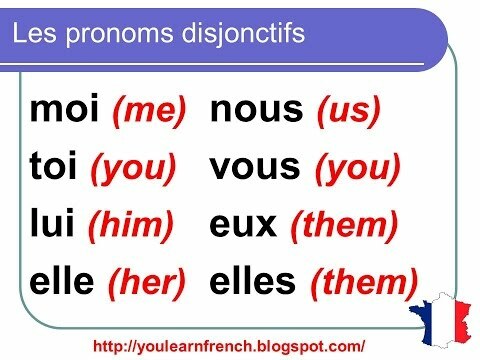 Bonjour Susan, In "She misses Jacques," the pronoun that replaces "she" is not a stress pronoun, it's an indirect object pronoun, and the feminine indirect object pronoun is the same as the masculine: lui. Merci beaucoup !! I see now that it was my mistake in thinking that a stress pronoun was required in this structure. So - Je pense à lui = I am thinking of him? Bonjour David, Alors, je ne comprends pas de tout en ce qui concerne votre question. Avez-vous eu une question? Je pense à lui est une phrase exacte. Bonne chance.